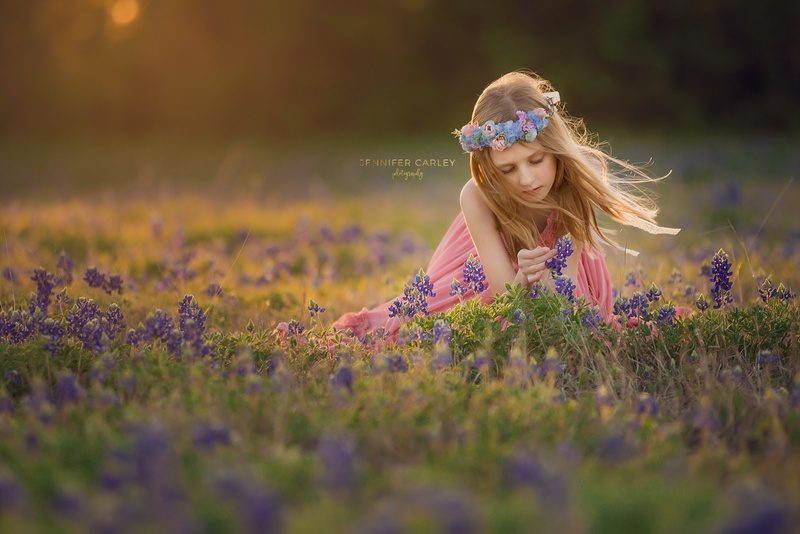 Jennifer Carley Photography is a child and family photographer in Flower Mound Tx serving North Dallas cities such as Flower Mound, Coppell, Lewisville, Southlake, Argyle, and Westlake. Jennifer enjoys outdoor natural light photography. Expect a classic, vibrant, and emotive style from Jennifer. Sessions incorporate a variety of traditional posed portraits in addition to semi-candid photographs. Jennifer offers high end boutique photography services. Image artistic quality is top priority over quantity of images. Clients receive work of art collection of images with utmost attention to detail. maternity, newborn, children, family, and high school seniors. Please contact Jennifer at least one month in advance to obtain your first choice on the calendar. During busy months such as September through November, please book at least TWO to THREE months in advance. During bluebonnet season, anticipate slots filling up fast. The photography session experience is fun and relaxed! Your photo session is on location at parks, urban areas, or even your home. Service areas include the surrounding DFW area. During your session, both posed and candid moments are captured. Memories are precious and can be preserved for generations to come. Before, during, and after your session, I work closely in preparing your family for a fun experience. Jennifer walks clients through details of choosing outfits, as well as location and time of day details. Sessions last about one hour. Sessions are a fun and relaxed experience. Children can be silly and explore. This helps families share connections and emotions. Images from the session are hand edited by Jennifer. She pays close attention to color tones and skin retouching to create a unique image each time. Jennifer does not simply apply a filter, but she pays close attention to the details of every image and perfects each unique image accordingly. Because of the intricate editing process, Jennifer emails photograph proofs to view on a private online gallery. At this time clients select their images, as well as order products like prints, canvases, and albums. Following the proofing process, Jennifer applies detailed edits including skin smoothing, blemish removal, and artistic enhancements to the clients’ selections. Final edited high resolution images are provided through the online gallery. Keepsake and bespoke products are available to order with Jennifer’s professional photography printing services. Please send a message about the type of session you desire.